Fish and ice cream typically don’t mix, though I wouldn’t put it past the crazy milkshakes at Black Tap to offer up some sort of weird thing like that. But at Taiyaki NYC, a Japanese ice cream shop having its grand opening today on the border of Little Italy and Chinatown, this union is oh-so sweet. Gucci Mane came out of prison almost the same way he went in– engulfed in a flurry of productivity. That means new tracks, an autobiography, and of course, dollar bills. “Gucci got more money than all these rappers,” he declares on “All My Children.” Indeed. But it’s not just stacks of paper and rhymes that make Gucci, the bad boy with a heart of gold, one of the most recognizable rappers of his generation. It’s his ice-cream cone face tattoo. In this age of liquid-nitrogen ice cream, rolled ice cream, and churro cones, you may think that where everyone’s favorite frozen treat is concerned, there’s nothing new under the sun. But don’t cry into your Kanye cone just yet. We’ve got the inside scoop (har) on two ice cream cone-ucopias that promise to be sweet as hell. Saturday, July 16, 10am-5pm at 176 Lafayette Ave. in Fort Greene; Sunday, July 17, 10am-5pm, at Manhattan Bridge Archway Plaza in Dumbo. Seven vendors will be whipping up special flavors for the Flea’s annual two-day ice cream blowout. If you’ve been too lazy to get out to Rockaway to try the P&B donut ice-cream sandwich at Citysticks, then head over to either Fort Greene (Saturday) or Dumbo (Sunday) to try the donut ice-cream sundae that Underwest Donuts has created using a custom flavor from Lower East Side favorite Il Laboratorio del Gelato. Good Batch will be serving up a birthday-cake ice-cream sandwich for lovers of rainbow cuisine, Blue Marble is apparently going cookie-crazy, and a new vendor, Malai, will be offering up Indian ice-cream floats and sundaes. The Flea’s usual array of vendors will be out in full force, so don’t drip anything on that mid-century lounger. With liquid-nitrogen ice cream shops opening in Williamsburg, the Lower East Side, and now the East Village, it’s safe to say there’s an appetite for the sci-fi dessert. But while the trend sweeps New York, two ice cream shops specializing in the cutting-edge procedure have clashed, with accusations of plagiarism and blatant imitation flying around. The frozen treats may be ice cold, but tempers are heating up. Just days after opening on St. Marks Place last Friday, Lab-321° is facing accusations from the Williamsburg-based -321° Ice Cream Shop (are you confused yet?) of stealing its logo and name. “They know we’re a hot topic right now,” said Allen Ruan, co-founder of -321° Ice Cream Shop, which has been around since last year. He explained that the flask design, the logo, and the name “-321°” are in the process of being registered, but that “we have the right to first use in commerce,” meaning that whoever came up with an image or logo and used it within a specific context first has the right to lay claim on it and use it. The specialty of -321° Ice Cream Shop in liquid-nitrogen ice cream, a treat that’s more reminiscent of a laboratory experiment than a home-churned sweet treat straight from the a bucolic dairy farm. It’s made by adding liquid nitrogen to a liquid cream concoction (think melted ice cream) and churning it all together to create the familiar thick, creamy texture in minutes. On the other hand, Tang explained that her shop’s specialties are marshmallow dips (marshmallows speared on a stick, covered in liquid ice cream, and then dipped in liquid ice cream), dragon’s breath (popcorn on a stick immersed in liquid nitrogen), and Thai-style rolled ice cream. “These are totally different things,” Tang said. She explained that the rolled treats are made by chopping up ingredients such as cookies, fruits, and chocolate into liquid ice cream, which is then spread on a cooling pan (cooled down to -13°C, or 8.6°F) and rolled into six individual rolls and then adorned with various toppings. Tang argued the use of the term “-321°” simply came from the fact that liquid nitrogen cooled at that temperature. The shop plans to expand its menu soon to offer more liquid nitrogen-based treats, such as liquid nitrogen-dipped ice cream egg rolls. Regardless, he was already in the middle of taking legal action. “We sent them a cease and desist letter. I actually called them, but they just hung up on me,” he said. Ice cold indeed. 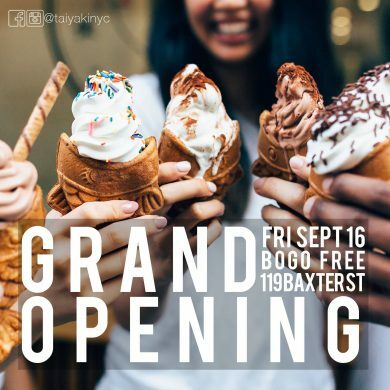 Davey’s Ice Cream is celebrating the opening of its second location, on Bedford Avenue in Williamsburg, with free scoops Friday from 6 p.m. to 9 p.m. Grab a cone of Whopcorn, a flavor special to the new shop, and if you’re an ice cream superfan be sure to enter a raffle for a chance to score a sweet new ice cream tattoo from Three Kings. Yo Carvel, Where Do You Think You’re Going? Come and get it, Lower East Siders! We just got word via a press release that Carvel is celebrating the opening of its “newest Lower East Side shoppe” with free ice cream. Exciting, right, Lower East Siders? I mean, the chef-driven flavors at Morganstern’s are alright and all, but nothing tastes quite like big chain ice cream (mmm, tetrasodium pyrophosphate!). There’s just one problem: the shop is at 9 Broadway, which, despite the announcement’s assurances that “Lower East Side guests will also notice digital menu boards,” is not on the Lower East Side. It’s in the Financial District, off of Battery Park, and yet franchisee Eric Chang is quoted as saying, “We hope to serve the Lower East Side for years to come.” Then you might want to move to the Lower East Side, bud. Because your shoppe is in the Financial District. When one creamery closes, another one opens. After two years at 201 Bedford Avenue, Williamsburg Creamery will officially close at 10:45 p.m. tonight. “We sold our establishment to Davey’s Ice Cream,” explained a person who answered the phone at Williamsburg Creamery. If you’ve been panicking ever since Van Leeuwen closed its Greenpoint store over New Year’s, a) you might have an ice cream problem, because it is freaking winter. And b) take a deep breath and update your address books: the store just reopened store six doors over. The new location, at 620 Manhattan Avenue, opened just minutes ago. Life on St. Marks Place just got sweeter thanks to two new dessert shops. Both ice cream maker DF Mavens and Asian-inspired confectioner Spot Dessert Shoppe opened their doors in recent weeks. Antica Gelateria Gentile will be serving up just that – plus Italian coffee and savory Puglian specialties like focaccia-style pizza – when it opens in Williamsburg in the next few weeks. The Choco Taco Cappuccino. It Exists. While surveying the lineup for Hester Street Fair’s Ice Cream Social, we noticed that one of the vendors, Baldies, is offering a “Chaco” that’s described as “an artisanal take on the beloved ‘Choco Taco’ dessert.” Basically it’s a crepe shell filled with ice cream, with toppings like melted chocolate, almonds, and sea salt. Two Ice Cream Extravaganzas: Our Cup (or Cone) Runneth Over! This could be the most epic ice cream battle since Mr. Softee vs. Master Softee. 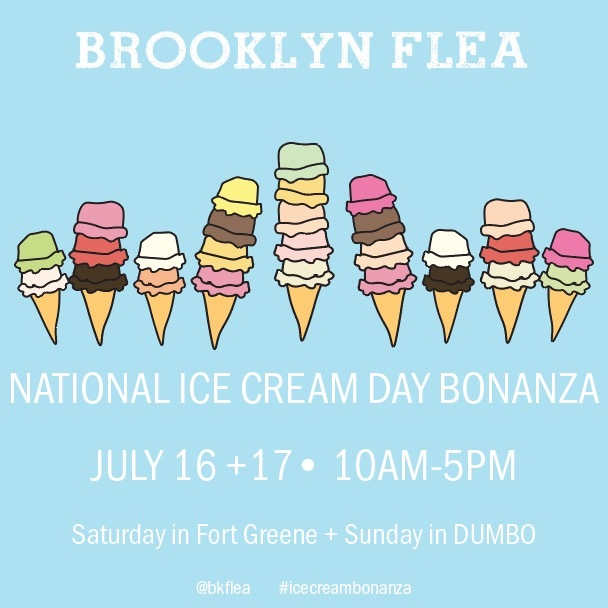 The Brooklyn Flea and the Hester Street Fair are each hosting ice cream extravaganzas — on the same days. That’s right: between the 10+ vendors (and 50+ flavors!) 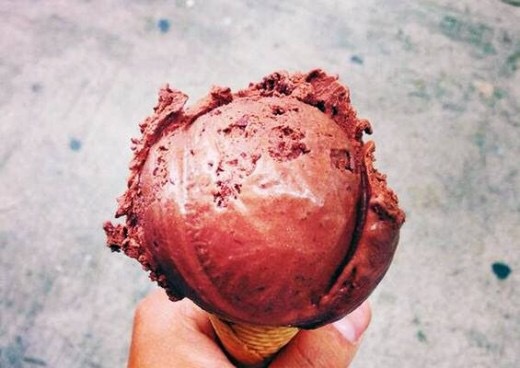 at Smorgasburg’s Creme de la Creme and the 14 vendors at Hester Street Fair’s Ice Cream Social, you’re pretty much definitely going up a belt size on the weekend of July 19.